By Samuel J. Cordes, Esq. 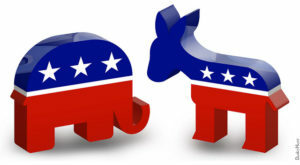 Can an employer use political affiliation with a party or movement as grounds for termination? Freedom of ideas and freedom of expression are central to American society. Political expression and political affiliation is the hard-earned right of every American citizen. For public and private employers, however, there may not be a desire to have politics discussed at work. The balance between an American’s right to freedom of expression and free market principles can intersect when an employee’s political activities may prove incendiary to customers, coworkers and management. It leads to the question, not easily answered: Can an employee be fired for expressing political views? That political affiliation was the “substantial motivating factor” in an adverse employment decision (such as termination or demotion). This protection is offered through the First Amendment of the U.S. Constitution. Later case law has upheld this constitutional right for public employees in Pennsylvania (for example, the landmark 2002 case Goodman v. Pennsylvania Turnpike Commission). Government employees who are fired because of political belief therefore can sue their employer to obtain backpay and reinstatement to the position. For private employees, the issue is less clear-cut. Private employers cannot discriminate against applicants and employees based on a protected class, such as race. Otherwise, in an at-will employment contract, employers have a wide latitude to end an employment contract for any reason, so long as it is not specifically prohibited by state or federal law. Political affiliation isn’t a protected class under Title VII of the Civil Rights Act. However, if an employer has a blanket rule to not hire anyone with a certain political affiliation, it could have the effect of violating the Civil Rights Act since certain race, national origins, or gender could have a closer affiliation to a political cause. While some states and municipalities prohibit employers from terminating employees for political affiliation, Pennsylvania has no state law preventing an employer from terminating an employee because of political comments made on the job. However, Pennsylvania does have a state law that prevents an employer from violating public policy of the state. In one case, Novosel v. Nationwide Insurance Company, the court found that an employer had violated Pennsylvania’s public policy because they had terminated an employee for refusing to lobby a political cause of the employer. In addition, employees can have contractual protections, such as under a company handbook, which prevents discharge based on political activities of the employee. Employees who believe they have experienced discrimination in the workplace, wrongful termination, or otherwise had their rights violated should contact Rothman Gordon online or call at (412) 338-1195 to discuss their legal options, including potential reimbursement or reinstatement to their position.